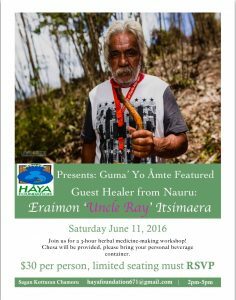 Håya Foundation Presents: Åmot (medicine) making workshop with Uncle Ray from Nauru. Please view the flyer below for more information. Saturday, June 11, 2016 from 2:00-5:00pm. You must RSVP at: hayafoundation671@gmail.com $30 workshop fee. Copyright © 2019 Sågan Kotturan Chamoru. Powered by WordPress. Theme: Spacious by ThemeGrill.